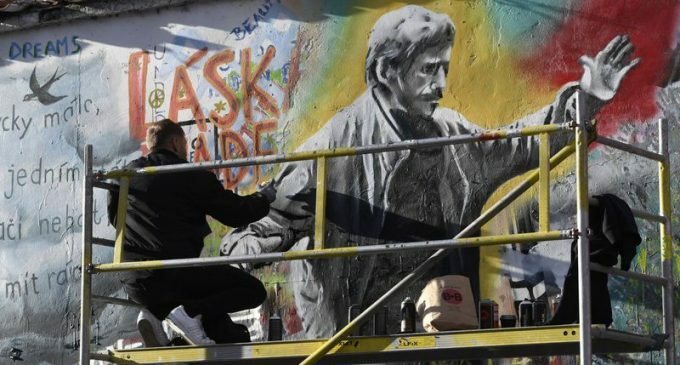 John Lennon’s wall in Prague, which features a wide array of thematic street art, is a popular destination for tourists and a symbolic site of Czech opposition to the communist regime. Now its surface features a whole array of new pieces. Thanks to a special event organised during the occasion of the 30 Years of Freedom celebrations, 20 artists from a multitude of countries added their artwork carrying messages of peace. Photo: ČTK/Michal Krumphanzl In a small and secluded square just next to Kampa Park there is a wall covered in street art that seems out of place in these historic surroundings. But, the old buildings that make up most of the square may well envy the attention it gets. Since the assassination of John Lennon in 1980, the wall has been filled with graffiti inspired by the singer, as well as pieces of lyrics from Beatles’ songs. During the twilight of communism it was the site where young Czechs wrote their grievances against the regime. Since then it has become a popular tourist site, but still contains much symbolic value and continuously undergoes change with new art pieces and messages appearing. A considerable addition of new artwork appeared on the wall this week, after twenty local and international artists added their creations inspired by the message of peace. Photo: ČTK/Michal Krumphanzl The leading figure behind the project was Pavel Šťastný, the man who created the famous logo of the Civic Forum during the Velvet Revolution. One of the artists who contributed to the wall was Saleh al Shukairi, who is considered to be among the leading visionaries of Arabic calligraphy art. “I did this artwork on a two by four meter strip of the wall and I had the opportunity to do it in different colours, so that I could show both the dynamic of Arabic calligraphy as well as how beautiful art is and how you can transfer words to an art piece. 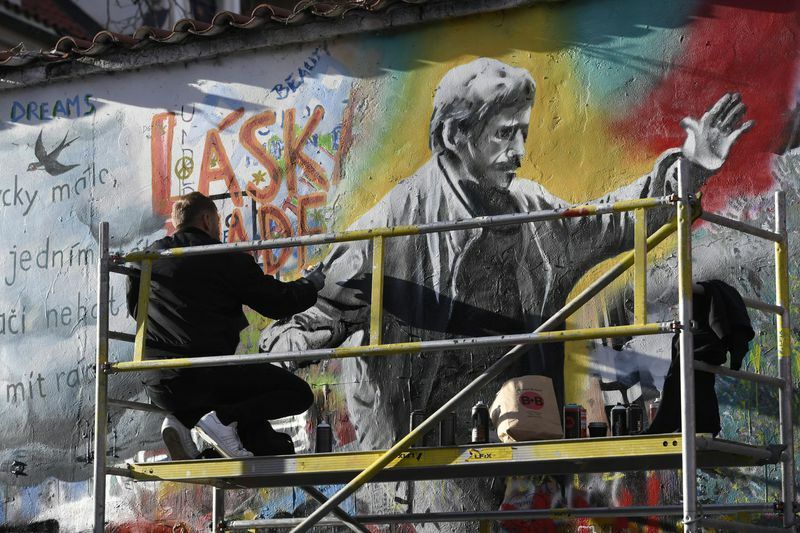 Other contributors included Czech artist Kurt Gebauer, a group of Serbian artists from the Saša Marčeta Foundation, as well as various ambassadors who painted over templates. Among them was Abdullah Mohammad Al Maainah, the Ambassador of the United Arab Emirates in the Czech Republic, who designed the flag of his country as a student. His design now also adorns the wall. Photo: ČTK/Michal Krumphanzl Mr. Šťastný was not just the main organiser of this event, but is also one of the organisers of this year’s 30 Years of Freedom celebrations, to be held under the auspices of the Senate. When exactly the exhibit will be on display in the Czech Republic is currently being discussed, but Mr. Šťastný says the local public should be able to see the exhibit sometime between the end of April and beginning of May.